Dummies for the HTC Thunderbolt might be indicating its original release date? One of our tipsters managed to send us some shots of dummy units of the HTC Thunderbolt that are starting to make their way into Verizon stores. Naturally, their arrival hints to the clear telling that an official launch isn’t too far away in the distance at this point. Still, we’re all in the dark regarding a concrete date on when this bad boy will actually land. In the past, we’ve heard rumors that it would be here in time for Valentine’s Day, but most recently, it was reported to have been delayed until February 24th. Regardless, the dummies might be showing off the handset’s intended release date – which of course, is right there out in the open as February 14th. Nevertheless, it would be almost unlikely for Big Red to shell out more money on getting new dummies with the correct date – if it indeed alludes to that. So if Monday arrives and we’re all still out in the dark about the HTC Thunderbolt, don’t be too alarmed because it shouldn’t be long before February 24th rolls along. Please Let It Be The 14th I Check Back On This Site Every Hour To See Something About The Thunderbolt Thats How Dedicated I Am Dont Need No HDMI With The Bionic I Love The Big Box Frame!!!! Come On Thunderbolt!!! I just heard a guy at Best Buy saying that the Thunderbolt will be coming out on the 15th, or at least that they'll have it in stock on that date. Me too...I joined the Droid family late in the game...just got my Inc. in Dec. and really enjoy it, but it looks like the Thunderbolt will utilize my upgrade on the other line...yea it's gonna be nice! I like how they maxxed out the screen size but in a little bit smaller overall size than the X. We just got word from our ISAM that the Thunderbolt has a release date of 2/24/2011. Yesterday, I was at Best Buy in San Diego and I ask the cell phone guys. They said the HTC Thunderbolt will be here on the 14th. Verizon might want to let people know when the phone is coming out if they want people to buy it! That might be why Best Buy has started taking pre-orders for it already. I'm really torn between this and the bionic. So just because there won't be any apps you would buy an inferior phone and get locked into a contract for 2 years? The phone wont be released tomorrow. It got pushed back. We have a dummy of it and I am not impressed with the design at all. One thing that is a problem that I hope is just because it is a dummy is that the kickstand seems very flimsy and easily breakable, especially compared to the EVO. Also with the speaker behind the kickstand, it could muffle sound slightly when it isnt opened and the fact that the charging port is on the side that touches the ground when it is sitting with the kickstand open is a huge flaw. I know HTC phones have bad battery life and thus when I am watching something with the kickstand I make sure, if possible, it is on charge too. 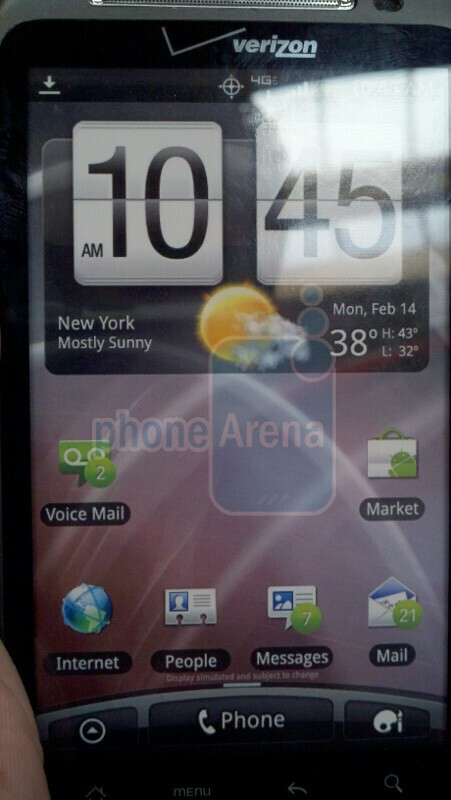 I love HTC, but I am not thrilled with this device and the timing of it's release.